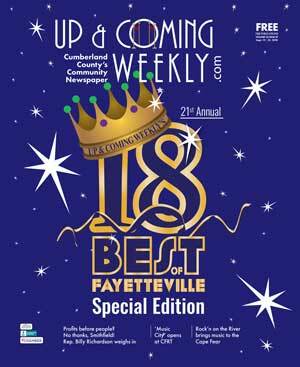 For more than 20 years, Up & Coming Weekly has been Fayetteville's, Fort Bragg's and Cumberland County's leading and most trusted community weekly newspaper. This "free" N.C. Press Associated weekly provides an entertaining and unique format for local news, views, opinions, art and entertainment venues that defines Fayetteville, Fort Bragg and the Cape Fear Region community. Up & Coming Weekly provides local area businesses and organizations an effective, dependable, professional and cost effective media resource for marketing, advertising, promoting and branding their businesses and organizations. Up & Coming Weekly is much more than a weekly newspaper. Since it's creation in 1996, the mission and focus of the publication has been to accentuate and illuminate the quality of life enjoyed here in Cumberland County. As an established and trusted community newspaper, Up & Coming Weekly's mission has never been to be the center of controversy or negativity, but rather to bring forth a dependable and aggressive media source that is free and publicly accessible that serves as an open forum for local news and expressing opinions on issues and events that are deemed relevant, important and vital to the community. This unique concept and format keeps the content fresh, relevant, fun and always exciting. It also keeps readers coming back week after week. 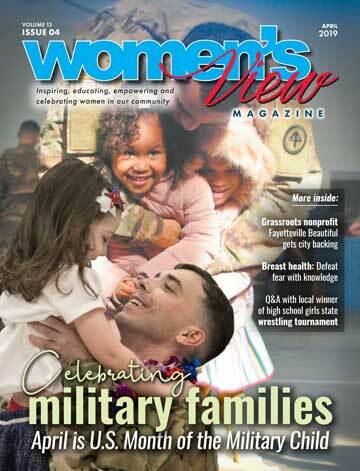 Up & Coming Weekly is one of three publications created by parent company F&B Publications. 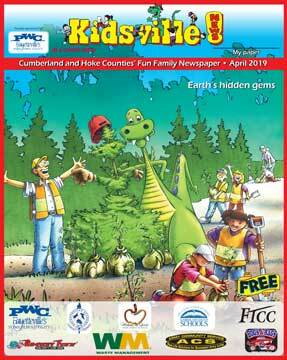 The others include Kidsville News!, a popular nationwide children's newspaper and educational resource created in 1998 and a local community directory, Up & Coming Weekly Pocketguide. Together, these three publications are referred to as "publications of purpose." If there was not a need or purpose for them in the community they would not exist. All three publications were conceived and created by owner and publisher, Bill Bowman. Bill Bowman established F&B Publications after purchasing the naming rights of a bankrupt magazine (Up & Coming) in 1996. He executed an idea and dream that was 9 years in the making. The company has since grown and developed into an icon of community pride. Dedicated and respected, Bowman's company has proven to be effective, profitable and a highly respected media company serving all communities throughout Cumberland County. Up & Coming Weekly is a highly recognized award-winning publication that holds membership in the North Carolina Press Association, Southeastern Advertising Publishers Association, Independent Free Papers of America and AFCP Leadership Institute. Bowman has served as a board member for each of these industry associations. Today, Up & Coming Weekly is the company's flagship publication and serves a community of more than 310,000 residents — a community that stays in a constant state of resident turnover due to the nature of our large population of active duty military personnel. Fort Bragg is the home of the 82nd Airborne Division and United States Army Special Operations Command. It is one of the largest and fastest growing military installations in the United States with more than 50,000 active duty soldiers assigned to the post along with their families. The post also employs 14,000 civilian workers. Fort Bragg continues to grow and as a result of BRAC (Base Realignment and Closure), the United States Army Forces Command ( FORSCOM) completed it's relocation to Fort Bragg in 2011. This brought thousands of additional troops, high ranking officers, businesses, civilian jobs and contractors to the area. This growth is having a significant and positive impact on the local economy and community. More than 30 percent of Up & Coming Weekly newspapers are distributed to Fort Bragg, Pope Army Airfield and Spring Lake. Up & Coming Weekly is the local resource that soldiers and their families turn to and trust for information about businesses, events and happenings in the Fayetteville/Cumberland County community. The revitalization of Fayetteville's Historic Downtown district is creating exciting and ongoing interest and economic growth in the development of downtown Fayetteville. It is quickly becoming a popular destination point for shoppers, diners and art and antique lovers as well as businesses and organizations that enjoy urban settings and lifestyles. Up & Coming Weekly enjoys an audited* readership of more than 26,000 weekly. It is 100 percent demand distribution and delivered every Wednesday by carriers to more than 500 locations throughout Fayetteville, Fort Bragg and Cumberland County. 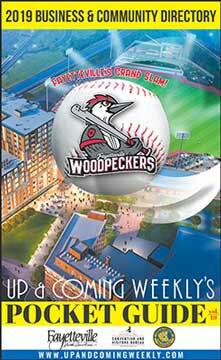 Up & Coming Weekly is also available has a "free" subscription of the electronic online "Early Bird" edition. This VIP "Early Bird" is delivered directly to subscribers' computers anywhere in the world. Up & Coming Weekly's electronic online edition has the ability to follow a deployed civilian or active duty soldier around the world enabling him or her to stay in touch with their families and their community. For marketing, sponsorship or advertising information, call: 910 484 6200 or email us. * Audited by the Circulation Verification Council (CVC).